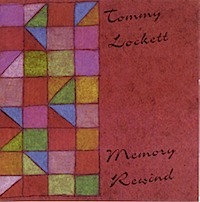 Memory Rewind is a 2 disk set that was produced,recorded and mixed in 1998 by Tommy Lockett. It features the great guitarist Jamie Glaser and drummer Atma Anur. All songs are composed by Tommy Lockett except "A Call for all Demons" which is composed by jazz legend Sun Ra. Tommy also c-composed 2 songs with Jeff Holly a saxophonist, DJ, living in Amsterdam. Memory is a album that reflects some of the changes that I was going threw, as well as dealing with the loss of my dog Cajun who was "Christ on four legs". The songs defiantly have attitude and edge, that only Jamie, Atma, and myself could produce is this period of life.